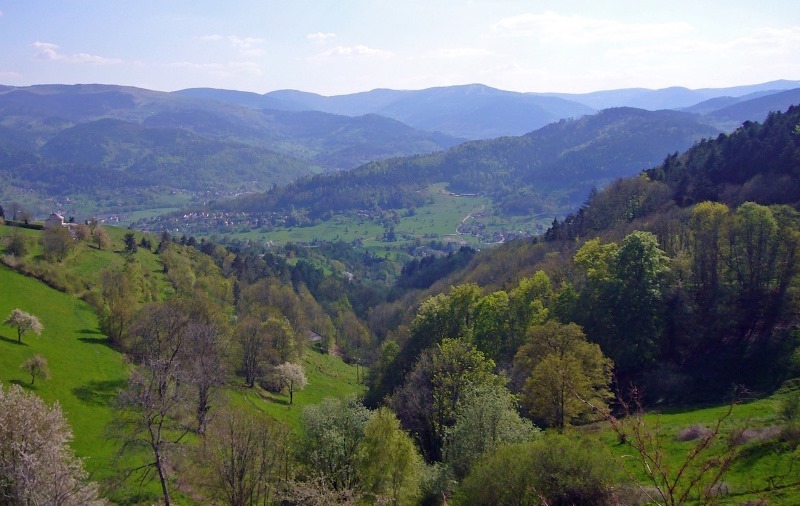 Getting there: the Vosges mountains range in central western Europe, characterized by fine forests on the lower slopes, open pasturages at height and rounded shape of their peaks. Easy to get in by the highways from Germany, Belgium and France. From Holland its only an couple hours by car. You could take the TGV Paris-Epinal, but after that it’s quite a distance…. We walked here in 1987 (!) and as a result of taking (too) little water, while high temperatures and burning sun, we drank about 8 bottles Oranginas lemonade p/p at the first occasion to do so. That’s why we called ourselves “ the Oranginas”, thereafter. Maps: Good walking maps available everywhere in the region. We used: IGN 3619 OT, scale 1:25.000. Accommodation: plenty: hotels, pensions, Gites d’étappe, chambre d’hôtes , Gites ruraux, at the farm, at a castle, whatever you want (to pay). 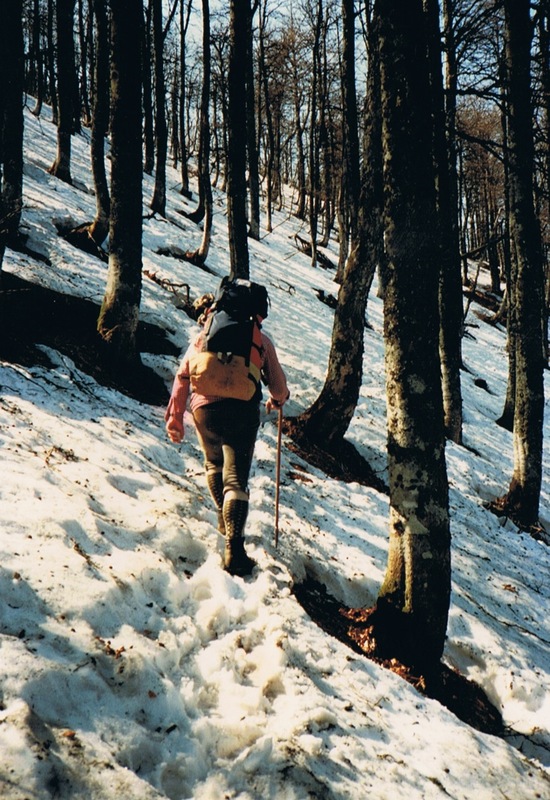 Easter 1987: a criss-cross trail at the Vosges mountains. L’ascension du Grand Ballon, le Parc Regional des Ballons, la gastronomie formidable et le vin! Distance between de stages: 10-19 km. Day 1: Munster - Buhl..18 km. Day 3: Moosch - Sewen...19 km. 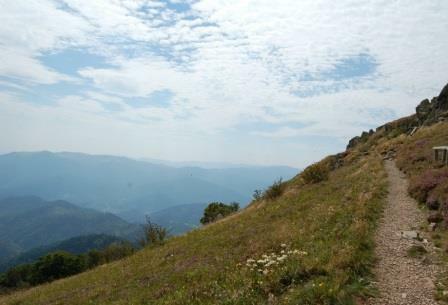 Day 4: Sewen - Ballon d’Alsace ( 1247m. 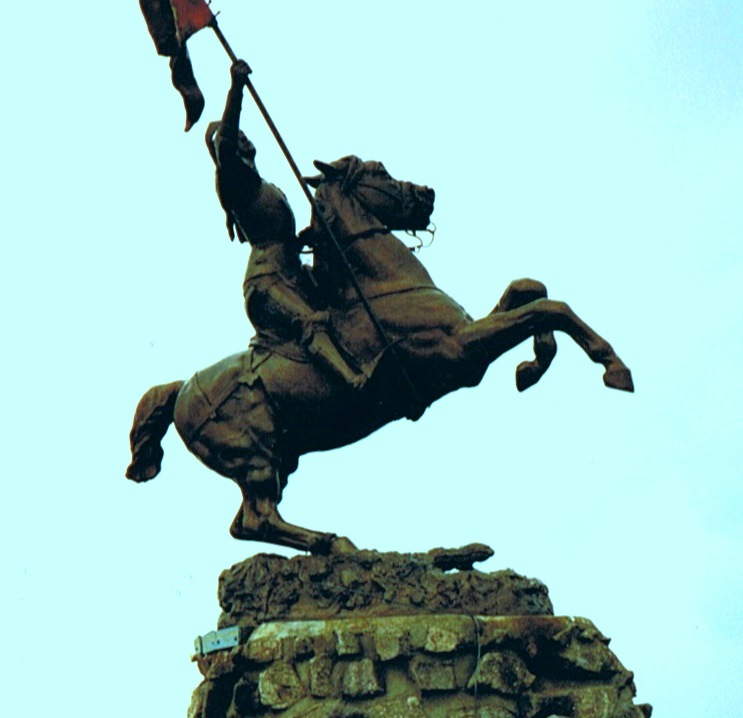 )..10 km. 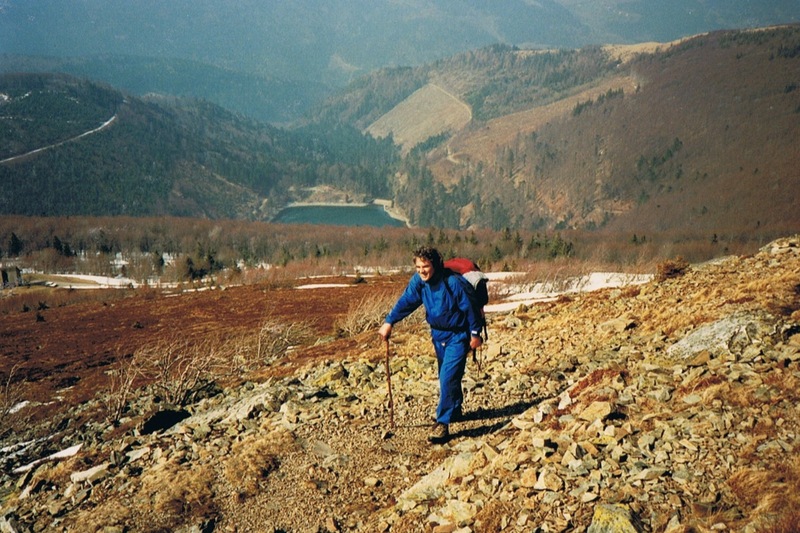 Day 5: Ballon d’Alsace - St. Maurice s. Moselle....about 9 km. On trail: wet and high altitude meadows, deep valleys, waterfalls, lakes, cliffs and rocks .Continuously beautiful views. With clear weather you can see part of the Alps. 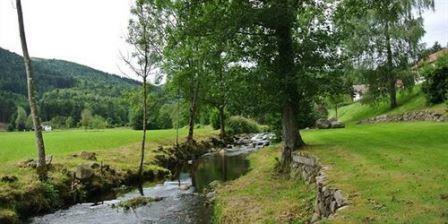 Or parts of the Alsace. 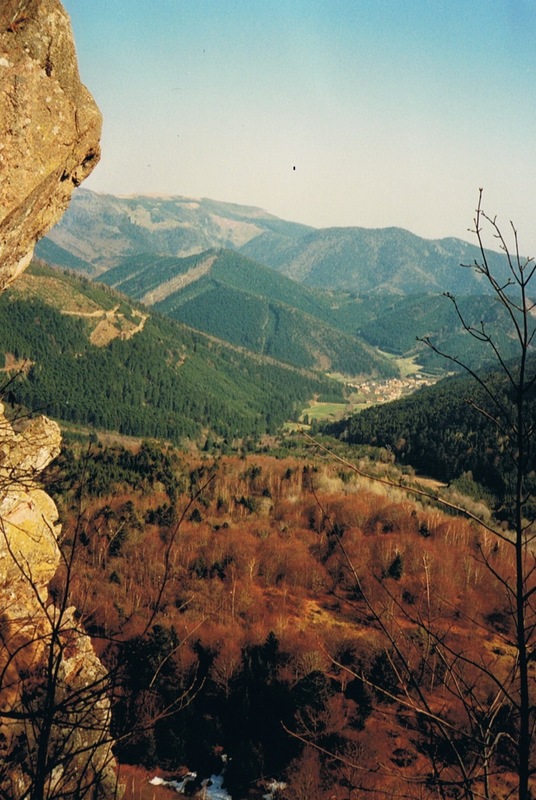 Beautiful sandstone formations, les chaumes, primeval forests, a lot of Roman and Celtic remains. Castles from early Middle Ages. With a bit of luck you can spot the Rupicapra (gems). Hiking through a - largely - protected area (Regional Nature Park), with about 18000 km. 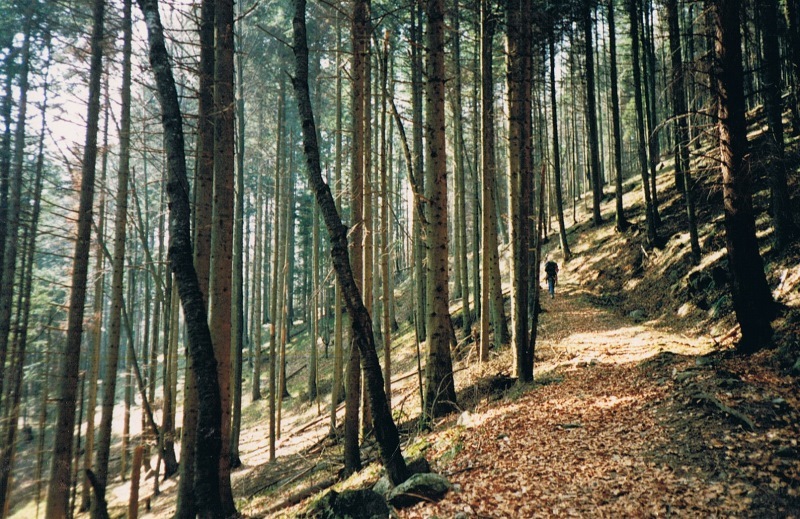 way marked trails. Castles, rivers, ever changing scenery.....lakes ...... and good food. 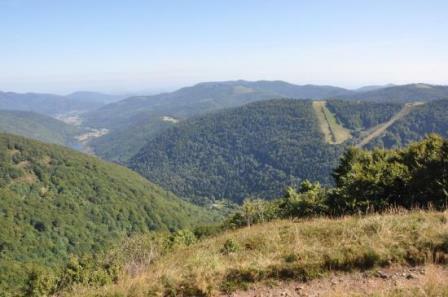 If you want to experience the Vosges in peace and quiet during a hike, choose for a hike between mid-May and mid-June or in the second half of September. It can be very busy with people who "climb" the Ballons by car or roaring motor.